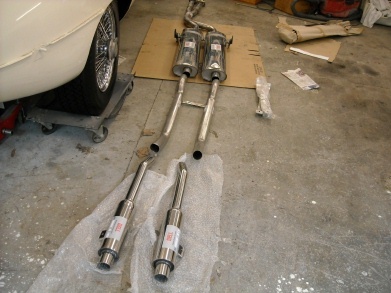 It was time to install the exhaust system on the 1967 E-Type 2+2 that I am restoring. I thought this might be a ½ day job. Boy, was I wrong. What a pain it was! Here are the highlights (and lowlights). 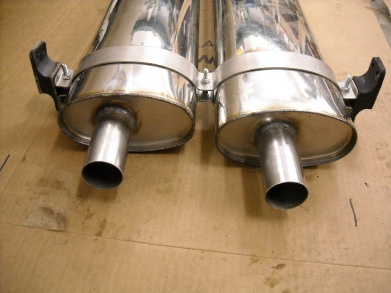 Quite a while back I had purchased a stainless steel exhaust system from SNG Barrett. The salesman recommended the Bell system out of England and a quick search of Jag-Lovers archives found numerous positive postings regarding the Bell system. Many folks mentioned that the parts all fit together well and mated up to the car well. The ends of some of the tubes had to be expanded slightly to allow them to connect together. Robert at R&J Custom Exhausts does the job correctly. 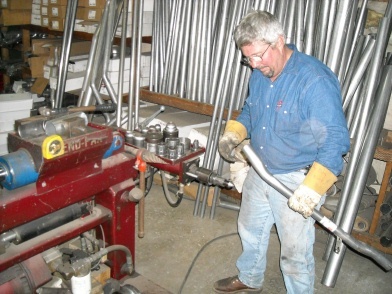 proper equipment, a socket can be formed readily. Any exhaust shop has a machine that bends pipe and adds the sockets. So for me it was off to R & J Custom Exhaust in Apex where Robert made short work of adding the necessary sockets. He also made a pipe end that had been flattened during shipping round again. Bring the outside bolts together first, then run down the center bolt until the width of the assembly matches the opening in the floor of the car. at two points (actually 3 if you count the 2 hangers on the center mufflers. All of the hangers have a rubber component for vibration isolation. The rear hanger above the resonators also is designed to allow the system to grow longer to the rear of the car as it heats up. A trial fit of the rear hanger revealed no problems. The middle hanger on the mufflers was another story. When I first assembled it and trial fit it under the car, everything seemed about an inch too wide. This was an important inch, since the floor sheetmetal has a pocket that is a defined width that everything must fit in. Too wide and it just won’t go. I finally found that the way you tighten the clamps around the mufflers makes a difference in how wide the assembly becomes. The trick is to tighten the outer bolts a lot and then tighten the one bolt in the middle until the clamp bends to the correct width. Did I mention that you need to have the driveshaft, parking brake, and heat shield installed prior to installing the exhaust system? By the way, my heat shield was so trashed from violent contact between it and the exhaust system that I had to fabricate a new one. I did salvage the insulative material, which I expect is asbestos so I handled it with care. At this point, most issues seemed to be dealt with and I begin final installation. Whoa there, another problem. 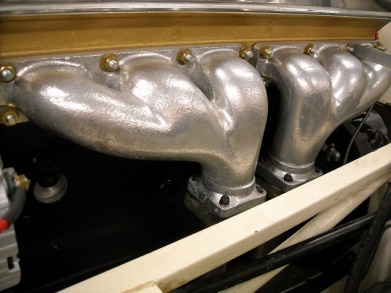 The round gaskets supplied to go between the exhaust manifold and the first sections of piping were too small. Another search of the Jag-Lovers archives revealed that others had experienced this problem. The solution was to go from the all metal gasket supplied to a fibrous type made for various American cars that can be opened up if necessary. Car Quest had the necessary part. A great look when complete!! was successfully bolted to the manifolds and the system was sitting on a blocks of wood under the car. That would be diagonally across the car! I had to coax each and every connection to get the path of the system aligned with the axis of the car. Oh, did I mention that I had to drill new holes in the floor to accept the muffler hangers? The holes supplied by Martin Robey did not line up for me. But you know what? 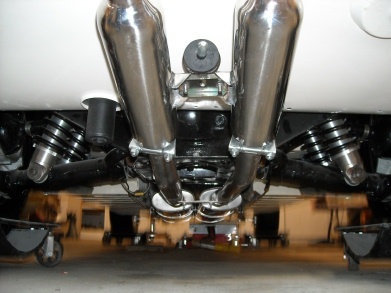 After this job is complete and that glorious shiny stainless exhaust system is hung, it really looked great. Like, let’s start this baby up! Well, not quite yet but we’re getting close. Does it matter which direction I mount the Bell muffler section ? My supplied SS Bell S1 system has two long pipes on one end, and two shorter pipes on opposite end.